We are a leading Manufacturer of four side moulder and ufm-5 four side moulder from Ahmedabad, India. 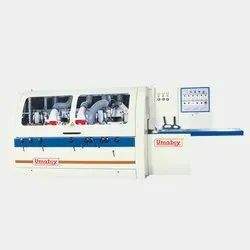 Shree Umiya F.Tech is the Four Side Moulder to meet with increasing demands of industries. The working Thickness of the machine is started from 8 mm up to 120 mm. It is having the Manual bed lubrication system that would reduce the friction between surfaces that improves the feeding difficulties of wooden objects. Inverter feeds speed of 6-30 m/min. Individual motor to each spindle to save maximum power transmission. Hard chromed bed flats to minimise bed wear. Bottom driven plate rollers for increased feeding performance. Manual bed lubrication to reduce friction and improve feeding difficult timbers. Sealed safety enclose to reduce noise levels, improve extraction operator safety. Umaboy is available with wide array of UFM-5 Four Side Moulder, built up using latest technology and quality raw stuff in the guidance of our dedicated experts. These are admired by customers because of its rapid cutting speed and higher accuracy. It is having the feed speed up to 6 to 30 meters per minute. The all uncovered parts of machines are sealed safely to reduce the noise level of machine furthermore it increases the productivity of machine and provides assurance about operator’s safety. It contains the Programmable PLC controlling system that makes the use of machine very easy and effortless.